A couple of weeks after the St. Louis cat show, I got this box in the mail. It contained some flyers and brochures for my upcoming cat shows, including the one I will be at on Saturday, at the Glendale Civic Auditorium, not far from our house. But included were some special cat show materials. I got a bunch of copies of this cool CFA coloring book! I got a couple of copies from the Ambassador Program human in St. Louis, and she ordered more for us to give away at the shows I attend as a Pet Me Cat! It is a really nice coloring book, very well made. They are amazing handouts for the kids who come to cat shows. Maybe I will give high fives along with the coloring book. I am also probably going to wear this dress. I brought it to the last couple of cat shows, but never got around to wearing it. I’ll pick out some more outfits today. Oh, did I mention the other awesome thing about getting these special cat show materials? 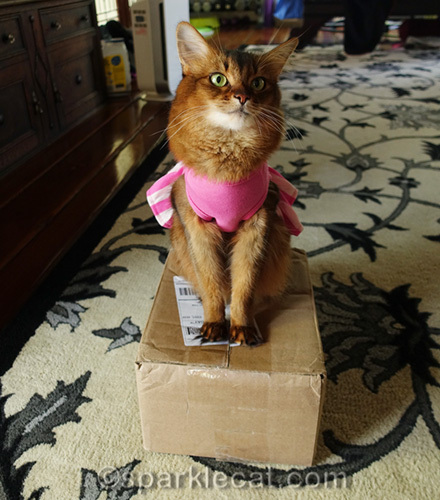 The box they came in is the perfect size for me! What a fantastic coloring book! It’s so important for children to know how to take good care of their kitties. I love all the cute outfits you have. My newest kitty, Kotoha (i found her last year on July 6th and had to bottle feed her since she was just two weeks old) would look so cute in some of the outfits you have. I’m just wondering how to size a cat for these? I see plenty of cute outfits for dogs (and, it’s virtually impossible to find anything but Halloween costumes or dog coats for my three rescued Treeing Walker Coonhounds, so I don’t know much about sizing). I want to get a couple of things for Kotoha. I need to get her in for a weigh-in, since she’s now one year old, but I’d guess she’s in the 7-8 pound range. It takes a little guesswork. I’m a hair under 7 lbs. and I fit into either an X-Small or a Small, depending on how the sizes run. Like human clothing, there is no real standard. But it is fun to think about! Those look like very nice books for you to give out to the kids. 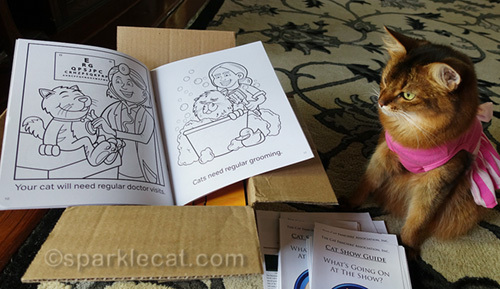 That looks like a really fun coloring book, and what a great way to teach kids how to care for cats. Have fun at the show! Brilliant. The kids will learn as well as colour. We LOVE that. That coloring book looks like the type TW could color. Those adult coloring books are waaaaayyyy over her talents. What a great coloring book, Summer. Kids…and even some adults…are gonna love getting it from you. Have fun at the show. Summer, those are great handouts. the coloring book is really nice. we love your floofy little paws too 🙂 have fun this weekend! I bet you’ll be the highlight of the cat show as the Pet Me cat, Summer! Love the coloring books and the high 5 will make their day!! Your dress is really pretty like you. Those coloring books look like fun. And that is a nice box too. A colouring book AND high fives from you? Some lucky kids, we say! Have fun, Summer! What nice handouts! Of course, *you* are the real star, Summer! Those are awesome coloring books, Summer! We hope you can give a bunch of them to kids at the show, and maybe one or two for the library/waiting room/etc. for the kids you visit, too! Good luck at the show. I think you will have a great time. The coloring books look fantastic. What a good idea to hand them out. Have a good week end. Summer, you look adorable! And you are right; that box is perfectly-sized for you. Is that a cheerleader outfit? It’s very cute. And total score with that box. I like your idea of a high-five with the coloring book! Very clever of you. And the pink dress is absolutely stunning! I wish I could come to that show and meet you! Are you a Turkish Angora? These are super cute pictures, especially the fourth one! 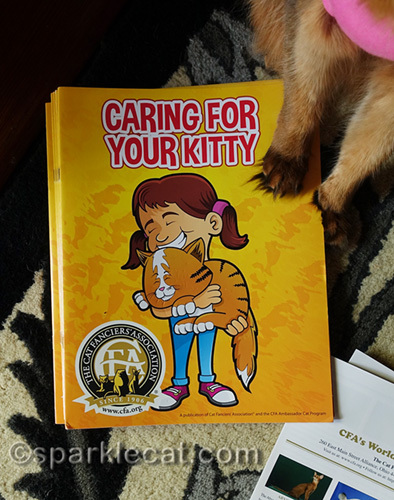 In the Caring For Your Kitty book, that girl holding the kitten, reminds me of a couple of regular attendees to cat shows in Washington State, where a couple of little girls hold their kitties much of the time! One daughter of a breeder, actually loves to hold the Selkirk Rex Mama Cat, who belongs to another breeder! Those are marvelous hand-outs. Reach them, and teach them while they are young! Very cool coloring books. Giving a high five with a book would definitely make someone day, we bet! Have a fun weekend! A high five and a coloring book is a cool deal pretty Summer, have fun! Oh you will have such fun! And do please wear the dress. It suits you beautifully. Oh boy, the kids will love those coloring books! Be sure to pawtograph them! A good box is always the most important feature of a parcel! Now that is an excellent idea for getting the young humans engaged with the cats of this world and foster good experiences. I think you’ll be a real hit with the dress and the books too… maybe you could have your own colouring hand out for your Therapy Cat visits. That sure would be an excellent gift to remember you by. Very nice handouts you have Summer. We also like your dress. It is pretty. Hope you have lots of fun at the show! Too cool! You’ll have a fun time giving those out!